Every time someone mentions the phrase “blackjack strategy” I’m reminded of the scene in the movie Vegas Vacation where Chevy Chase is explaining to a young woman at the blackjack table that a skilled blackjack player can get the advantage over the house. The implication is that if you just make the right playing decisions, you’ll be a winner. Most savvy blackjack players understand that the truth is more complicated than that. Take a look at how I’ve broken down a basic strategy for playing blackjack, tips on how to bet, and where you can safely play blackjack online. Basic blackjack strategy (or “basic strategy”) refers to the mathematically correct play for every single hand of blackjack that can possibly be dealt. It seems like it would be an overwhelming list of rules and tactics to memorize, but it’s probably easier to memorize than you think. But even if you do play perfect basic strategy –100% of the time– the house still has an edge of 0.5%. In fact, depending on the nuances of the particular blackjack rules at the casino where you’re playing, the house edge could be higher than that. An extreme example is 6/5 blackjack. This is a variation of blackjack that pays out 6 to 5 on a blackjack instead of the usual 3 to 2 payout. At most blackjack tables, if you bet $100 on a hand, and you get a blackjack, you get paid $150. That’s a 3 to 2 payout. But at a 6/5 blackjack table, that payout for that blackjack is only $120. Seems like a relatively small difference, especially if you’re playing for $10 a hand instead of $100 a hand. According to Ken Smith’s site BlackjackInfo.com, that single rule’s variation adds 1.39% to the casino’s edge. So even if you’re playing perfect basic strategy, the house now has an edge of 1.89% instead of 0.5%. What does that mean in dollars, over time? The house edge is the amount of money you can expect to lose –expressed as a percentage– every time you bet over the long run. The long run is thousands or tens of thousands of hands. The more you play, the closer your results will get to the theoretical mathematical outcome. So if you’re playing for $100 a hand at a typical blackjack table, you can expect to lose 50 cents per hand. That’s cheap entertainment, folks. Change the game to a 6/5 payout for a blackjack, and now you’re losing $1.89 per hand. That’s a big difference. The cost of your entertainment has gone up by a factor of almost four. Imagine if a movie ticket at one theater cost $9, and at another theater, it cost $36. At which theater would you see the movie? You should be using the same kind of thinking when you’re analyzing casino games like blackjack. But keep this in mind too – even if the house edge is low, if you play long enough, you’ll eventually lose all your money. The only difference between a house edge of 0.5% and a house edge of 1.89% is how long it will take to lose all your money. And what about this legend of blackjack players being able to make a profit? It takes more than a basic strategy to make a profit in blackjack. You need a bigger strategy, and that usually means counting cards. Other ways of profiting at blackjack exist like shuffle tracking and dealer tells, but card counting is the most common way to get an edge over the casino. But even if you can count cards, your edge over the casino is probably not going to be much more than 1%. And that’s if you find games that are favorable to counting cards –which most casinos don’t offer. I’m not even a very good card counter (and I almost always play blackjack drunk) and the casinos still shuffle up on me every single hand once they realize I’m counting. And when they start shuffling every hand, you can forget about your 1% advantage. You’re right back to your 0.5% disadvantage. A lot of people use charts to memorize basic strategy. 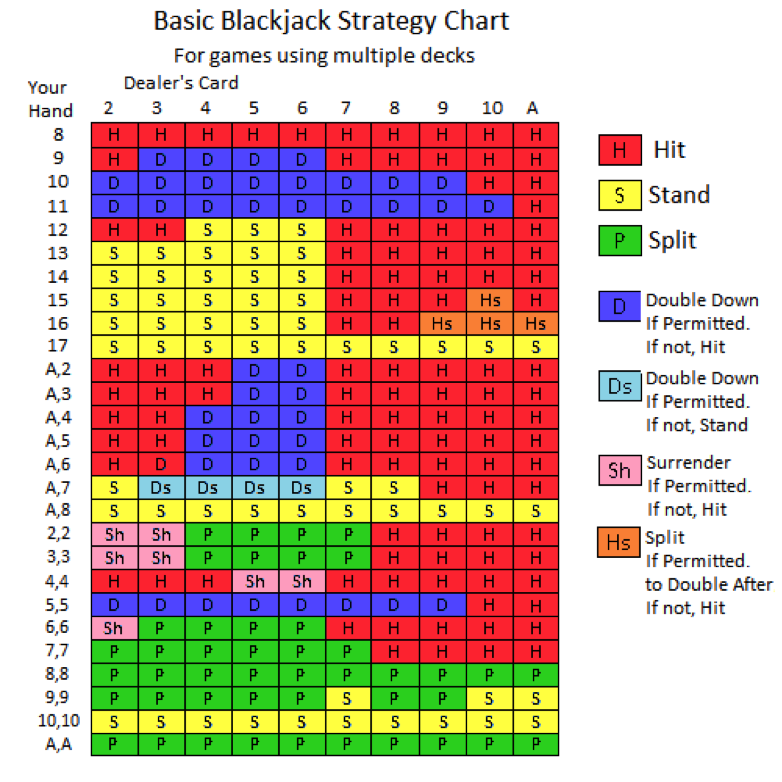 If you’re looking for a place where you can get great blackjack strategy charts, I’m going to recommend Ken Smith’s site again. You can input the rules variations you’re expecting to face, and his site will automatically generate an accurate basic strategy chart for you. Another good place to go for basic strategy advice is Michael Bluejay’s site, VegasClick.com. Not only is the information he offers there accurate, it’s clearly and entertainingly written too. But here’s how I’d suggest that you learn basic strategy. Divide the types of hands you’re going to be dealt into categories, and then learn how to play each hand in each category. A hard hand in blackjack is a hand without an ace, so it only has one total. 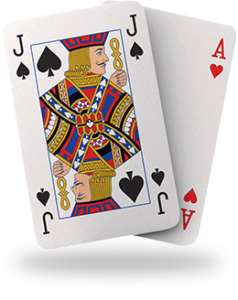 A hand with an ace can have two totals, depending on whether you count the ace as a one-point card or an eleven point card. If you have a hand with an ace in it that would bust if you counted the ace as an eleven point card, then you’re still facing a decision with a hard hand or a hard total. That covers a pretty good bit of ground right there, and I don’t think you’ll have a hard time memorizing that. 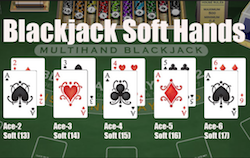 So you’ve now memorized exactly how to play 13 different potential hands in blackjack. See how easy this is? A hard total of 12 is a little trickier, but not much. You’ll hit if the dealer shows a 2 or a 3. You’ll also hit if the dealer has a 7 or higher. Other than that, you’ll stand. This is the only hard total that might be hard to memorize the basic strategy for, but the rest of the hard hands are so easy, you surely can get this one down with enough time and effort. That’s basically 4 rules to remember, for a total of 18 potential blackjack hands. Once you’ve memorized the basic strategy for hard hands, memorize the basic strategy for soft hands. I should also point out that the advice above doesn’t necessarily apply if you have a hand that could potentially be split. For example, if you get two 8’s, you’ve got a hard total of 16, but you wouldn’t stand or hit, you’d split. Splitting hands will be covered below; there aren’t many of them. A soft hand in blackjack is any hand with an ace in it where the ace can be played as either a one-point card or an eleven point card. For example, if you have an ace and a three, you have a “soft 14.” It’s soft because if you get dealt a ten, for a total of 24, you can decide that the ace only counts as 1 point instead of 11, and your total becomes 15 instead, and you don’t bust. 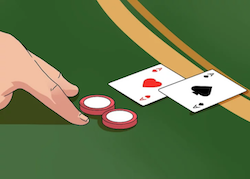 Soft 13 or Soft 14 – Double down if the dealer shows a 5 or 6. Otherwise, hit. Soft 15 or Soft 16 – Hit if the dealer has a 2 or 3, or if the dealer has a 7 or higher. Otherwise, double down. 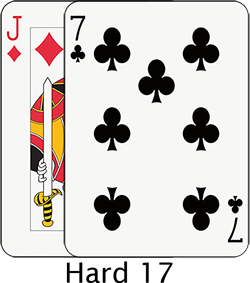 Soft 17 – Stand if the dealer is showing a 7. Hit if the dealer has a 2 or an 8 or higher. Otherwise, double down. Soft 18 – Stand if the dealer is showing a 2, 7, 8, or ace. Hit if the dealer is showing a 9 or a 10. Otherwise, double down. Soft 19 or Soft 20 – You should always stand. Those are five rules to memorize, for eight potential hands, and they seem complicated, but think about it this way. One of the five rules is to always stand on a soft 19 or soft 20. That’s a no-brainer. The only other thing to learn is when to double down, stand, or hit. If you can learn a foreign language, you can learn how to play these eight soft totals without too much trouble. Some people do find memorizing a chart easier, but I always thought that was nearly impossible. When you’re dealt two cards of the same rank, you have the option to split them into two hands by placing an extra bet. There are only 10 potential hands you could split, since face cards all count as 10. The rules for splitting are easier than you might think, too. And once you’ve memorized these, you’ve finished memorizing basic strategy. Always split aces or eights. That’s 2 out of the 10 potential hands you might split right there. Never split fours or fives. Treat them as a hard eight or a hard ten. That’s 2 more, so now we have almost half of the potential splitting hands covered. With deuces or threes, split if the dealer is showing a 4 through 7. Otherwise, treat the hand as a hard 4 or a hard 6. You’re more than halfway finished now. Split sixes if the dealer is showing a 3 through 6. Otherwise, treat this hand as a hard 12. Split sevens if the dealer is showing a 2 through 7. Otherwise, treat this hand as a hard 14. Always split 9’s unless the dealer is showing a 7. If the dealer is showing a 7 in this situation, just stand. That’s another six rules to learn. So far, you’ve memorized a total of only 15 rules. Three more rules, and you’ll have mastered basic blackjack strategy. If you have a hard total of 9, 10, or 11, it’s often correct to double down. That means you’re agreeing to take one (and exactly one) more card, and you get to double your bet. You should always double down on 11 unless the dealer is showing an ace. In that case, just hit. You should always double down on 10 unless the dealer is showing a 10 or an ace. In either of those cases, just hit. If you have a hard 9, you should double down if the dealer is showing a 3 through 6. Otherwise, just hit. While playing blackjack is fun and exciting in a land-based casino, it can also be enjoyed online. Many players like having access to blackjack online as it makes playing the game much easier. No travel is involved, players simply log online and get started. So how do you play blackjack online? First, you must find a top-rated online casino. Our pick would be BetOnline. At this online casino, you will find several variants of the game including American Blackjack, Spanish Blackjack, Blackjack Switch, Double Exposure Blackjack and more. With online blackjack game play, an account must be made at the casino. At BetOnline, players can easily sign up and play in-browser. Sign up for an account, make a deposit and choose the blackjack game you want to try. Betting limits will vary based on the game you choose. You will find the online games are played the same as land-based blackjack games. Play Blackjack online at BetOnline, sign up and claim your welcome bonus. When it comes to online blackjack tactics, you will approach the game a little bit differently than when playing in live form. To begin, a smart tactic to online blackjack gaming is to choose an online casino that offers a promotion based on the game. Take for example BetOnline Casino. This site offers several blackjack promotions including a $2,500 Blackjack Boss Tournament, Monday Night Blackjack and more. You are already logging online to play blackjack, so why not take advantage of ways to earn extra cash! While there is no sure-fire method to winning at the game of blackjack. When it comes to online play, your decisions are just as important as they are when playing the game in live form. You must know the rules of the blackjack variant you are playing and take time to learn more about the strategy for that particular game. With online play, you can forget card counting. Using this blackjack tactic only works with live gaming. So how do you win when it comes to online gameplay? To begin, know when to hit or stand. Find a good chart within a strategy guide online and leave it pulled up as you play so you know the right moves based on the cards you are dealt. Another tip is to always double down on 10 or 11. When you double down, you are able to double the bet you placed after you receive your first two cards. 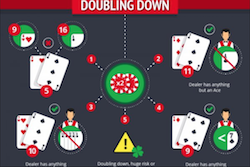 If the dealer is showing a 2, 3, 4, 5 or 6, they will more than likely bust so strategy dictates that you double down to earn even more during the hand. Basically, you need to find a strategy that works for you. Consider the type of blackjack game you like to play, be it traditional or Double Exposure, etc. Find a strategy for the game and give it a try to see if it works for you to begin earning win after win. When it comes to online blackjack, you want to be sure to find games at the best online casinos available. The casinos available to you will be dependent on your location. Below are a few examples of online casinos for both US-based players and International options. Use the suggestions below to find the best online casino for blackjack in your region. At this online casino, you will find a ton of blackjack action. Betway Casino has many games such as Classic Blackjack, European Blackjack Gold Series, Bonus Blackjack Multi-hand, High Streak Blackjack and more. Betway also offers Live Casino blackjack, providing even more ways to play the game online. Another top choice for online blackjack games for international players is 888Casino. This online casino has Multi-hand Blackjack, American Blackjack, and Classic. Easily make a deposit and get started playing your favorite blackjack game. 888Casino also has a Live Dealer blackjack game on offer. As mentioned before, BetOnline is a great option for blackjack play, especially for US residents. The site provides a large selection of online blackjack games in the casino as well as in the live dealer section. Easily take part in promotions involving the game to earn even more during gameplay. At this online casino, players in the United States will have access to eight different blackjack games. Slots.lv offers single deck, classic blackjack, European and more. Take advantage of a welcome offer here, where you can play blackjack to help clear the new member bonus. 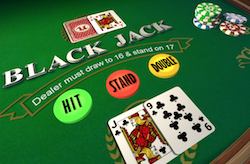 If you enjoy blackjack in a live setting but want to play the game online, you are in luck. Online casinos offer live dealer blackjack in several forms and betting limits. 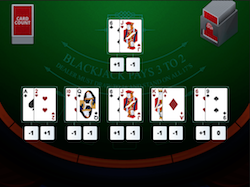 With live dealer blackjack, players are able to log online and play the game in live form. The game takes place in a casino or studio setting with gameplay streamed live to players online. By playing the live dealer version, players can enjoy the excitement of live gameplay, but from the comfort of the home. In the United States, live dealer gaming can be found at various online casinos, including BetOnline. At this online casino, fans of blackjack in the US can access games in HD format with betting limits starting at $10 and gong as high as $5000. Simply choose the dealer and get started in the game. For international players, the best options for Live Dealer Blackjack can be found at Betway Casino and 888Casino. Both online casinos provide live blackjack, offering betting limits for every bankroll. When it comes to blackjack online, there are bonuses and promotions provided by top online casinos as an incentive to play the game. With bonuses and promotions, you can pad your online casino account, having even more cash available to play the game. A few examples of promotions involving blackjack can be seen at Slots.lv and BetOnline Casino. BetOnline offers special Monday Night Blackjack as well as a Leaderboard Challenge within their Live Casino. With Monday Night Blackjack, participate in a weekly event with $3,500 in prize money up for grabs. Visit the $100 max bet multi-hand tables to get started. 1st, 2nd and 3rd place drawn winners will earn bonus cash plus free sports play. With the Live Casino Blackjack Leaderboard Challenge, $1,800 is up for grabs. Players will earn one point for every $10 played. The more points you earn, the higher you sit on the leaderboard. Finish the challenge at the top and earn a cash prize! Slots.lv is a prime example of a bonus that blackjack players can use. They offer a $5,000 Welcome Bonus can be cleared by the game. While blackjack does not contribute a large percentage towards clearing the bonus, it does count, which helps you to play the game you love and work on a bonus offer. Taking blackjack gaming on the go is a must for some players. With mobile capabilities, an online casino can offer players instant gaming via a web browser or via an application. The online casino you choose to visit will determine if mobile gaming is on offer and if you will need to download an application or you can play in-browser. Take Slots.lv for example. The online casino can be accessed via iOS or Android device via a web page. Simply log in to your account and choose your game. Blackjack is offered via mobile at Slots.lv, so you can take your 21 gaming on the go whenever you like. To play live blackjack with Bitcoin, you must first find an online casino that offers Bitcoin for deposit and withdrawal. BetOnline is one example where you will find Live Blackjack at the casino and Bitcoin as a banking method. 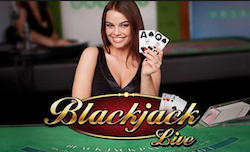 Live Blackjack games are located in the Live Casino at BetOnline. After logging in to your player account, simply choose Bitcoin as your deposit method. 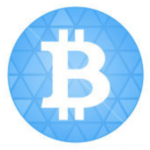 The site then carries you through the process of depositing Bitcoin, so you can begin playing the game. Bitcoin is a digital currency that is becoming more popular with online gamblers each and every week. There is more flexibility when using Bitcoin, especially for US players who may not have access to many options when it comes to depositing and withdrawing via an online casino. The term blackjack limits refers to the number of wagers you can place on each hand. With online blackjack gaming, tables usually start around $5 to $10 for a minimum bet. This means you have to place at least $5 or $10 on each hand, depending on the minimum. The online blackjack table will also have a max bet per hand. For some games, this might be $200 while others might go as high as $5,000. Choose your online blackjack game based on the betting limit you wish to place. Low rollers will need to go for a lower minimum bet while high rollers will opt of course for the tables with higher limits. When playing blackjack online, it is important to know what types of bets are available. Traditional blackjack games will operate the same as a land-based option, but others like progressives will have side bets. Learning more about these wager types will help you to choose which game you wish to play and know the right blackjack tactic to take once you get started. What are the different types of bets in Blackjack? Original Bet: When you start a hand, you place your first bet. This can be the minimum of the table or an amount up to the max set. Whether you Hit or Stand, this wager will determine how much you win if you beat the dealer. Double Down: If you choose to Double Down, you will double the amount of your wager, take one more card and then stand. Split: In blackjack strategy, there are hands where it is encouraged to split your cards into two separate hands. If you choose to split, you will then place a second wager, equal to the amount original bet on the other hand. Essentially, you now have two hands, with the same bet on each hand. You will now be dealt a second card for each hand and you can choose to stand, hit, etc. Insurance: Another option you have is to take insurance, but this is not usually recommended. This would be a bet that is equal to half of the original bet. You are betting that the dealer will hit 21. If he does, you win the surrender bet. If he does not, you lose this bet and then play your original hand. Side Bets: Some blackjack games offer side bets. Progressives are an example of a side bet in the game. A progressive blackjack game will have a separate jackpot that requires a side bet to be placed. This is usually a $1 wager and must be placed in order to qualify for the side jackpot prize. Rules variations at various casinos will change the correct decision for some hands, but the percentage you’ll be giving up by just following the basic strategy above will be tiny. Also, some decisions will change based on the composition of the deck. That will only matter for people who are counting cards. There’s a lot more to blackjack strategy than just memorizing basic strategy. You have to decide what your goals are, and then put together a strategy for how to best achieve them. If you’re going to play blackjack, you should at the very least learn basic strategy, because that usually means the difference between a house edge of 0.5% and a house edge of 2% or 3%, which is the average edge the house will enjoy if you just go with your gut. Whether you are playing online blackjack or a live game at a casino, the basic gameplay is the same. After placing your wager, you are dealt two cards while the dealer is dealt 1 card face up and the other face down. You then have to decide if you will stand and do nothing, hit and take a new card, surrender, double down or split. Understanding the terminology will help you to determine your action based on the cards you hold. There are different reasons to hit or stay in blackjack, based on certain factors. Using a blackjack strategy guide will help you to learn when to make which action. It can be beneficial to have a strategy card on hand to help you know when to hit or stand based on the cards you hold. The house advantage of the edge in blackjack can be quite low, depending on which game you play. By learning the right blackjack tactics, you can lower the house advantage to under 1%. While it is not illegal to count cards in a live blackjack game, a casino does reserve the right to kick you out if they so choose. A casino will be quick to ban a player they believe is counting cards.